The draw for the Wimbledon semi-finals was finalized yesterday. Roger Federer defeated 6’10’’ Ivo Karlovic in straight sets, as he continues his quest to win a record 15th Grand Slam title. He will face the surprise of the tournament, 31-year old Tommy Haas, who is playing the best tennis of his career. On the other side of the draw, fan-favorite Andy Murray swatted away “The Mosquito”, Juan Carlos Ferrero, giving hope to a crowd that hasn’t seen a British champion in 73 years. In the last Quarter-Final, it took Andy Roddick four hours and 5-sets to overcome a typical fighting performance from the Aussie, Lleyton Hewitt. The crowd would no doubt love nothing more than to see a Federer V. Murray final, as they are easily the most popular players at SW19. But do Haas and Roddick have enough left in the tank to spoil a dream final? Click on to get a preview and prediction. All eyes will be on Federer as he aims to take another piece of tennis history. Of course, he’s displayed his usual sportsmanship and neglected to talk about the possibility of breaking Sampras’s record of 14 Slam titles, but you have to think it’s on his mind. This really is the final piece of the puzzle for the man who has done everything else there is to do in tennis. And for someone who places such great importance on the history of the game, we know he’s thinking about the record. But this shouldn’t faze him. Nothing does. He’s had a typically impressive run at the Championships so far, highlighted by the dismantling of Karlovic in the last round. There’s nothing much else to say about him anymore. We all know what he’s capable of doing (anything and everything). Tommy Haas won’t be a pushover though. The veteran has turned back the clock and has produced his best run at a Grand Slam. He’s beaten Cillic, Andreev and Novak Djokovic on his way to the semis. You may remember he was one game away from beating Federer in straight-sets at the French just a few weeks ago. Nevertheless, it will still take a flawless performance to beat him on grass. I think Haas could cause problems for Federer in the first set, and maybe even clinch it, but he won’t be able to contain Federer for much longer than that. Prediction: Federer has got enough to see off this challenge in a hard-fought, 3-set victory. This is going to be a good one. Roddick and Murray are two fierce rivals, with short tempers, big games and a particular dislike for each other. The intensity will be high, and the crowd is going to be into it. This is the matchup of the tournament and you would be ill-advised to miss it. After years of heartbreaking misery (see Tim Henman), the British media have found another player to heave the nation’s hopes upon. But this time, it’s different. Henmam, as good as he was, never had the quality to win a Grand Slam, nor shoulder the pressure heaped on him by the media. At 22, Murray is already better than Henman ever was and he certainly has the potential to win Grand Slams. Although the pressure he faces is enormous, the “Murray Maniacs” don’t have anything on the “Henman Hill’ fanatics (yet). Murray holds a 6-3 record against Roddick, and his game is well-suited to counteract the big-serving American. He has shown in the past that he can neutralize Roddick’s serve and beat him from the back of the court. Although he needed 5 sets to dispatch Stanislas Warinka, Murray had a pretty easy path to the semis. After the straight-sets victory over Ferrero, he should be well-rested for what is bound to be a tough match. Under the watchful eye of his new coach, Andy Roddick has dropped 15 pounds in an effort to get back into the shape he was in when he won the US Open in 2003. The weight-loss has added another dimension to a fairly one-dimensional game. 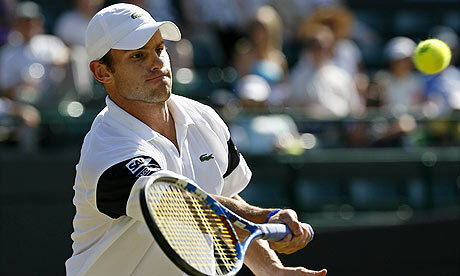 Critics have labeled Roddick a ‘one-trick pony’ in the past for his his lack of weapons to back up his monster serve. His game is starting to grow though, as he has increasingly followed these serves by coming into net, showcasing improved volleying and touch to finish points off. He’s also become a lot more patient from the backcourt and doesn’t go for the big shot too soon. This is evident from his run at the French (where the Americans have been traditionally ineffective on the slow clay) where he took time to set points up rather than trying to finish them as fast as possible. However, we also saw how his temper can get the better of him. The partisan crowd paired with Gael Monfil’s antics and Roddick’s insistence that it was too dark to continue play proved to be too much of a distraction. The environment on Centre Court against Murray will not be much different. If he wants to have a chance, he’ll have to keep his emotions in check. Prediction: Even though Murray has a clear head-to-head advantage, this match is hard to call. I feel like the smart money is on Murray but I really think Roddick can pull it out on the big stage. I’ll go with my heart instead of my brain on this one and call Roddick winning in 4 sets (it’s going at least 4, either way). This entry was posted on Thursday, July 2nd, 2009 at 8:20 am and is filed under Tennis. You can follow any responses to this entry through the RSS 2.0 feed. You can leave a response, or trackback from your own site. Haas is baseline defensive, will get you in trouble at Wimbledon. Haas didn’t beat Gonzales or Gilles Simon, he beat Igor Andreev and Marin Cilic. Both great players as well. Also, I believe Andy Roddick is 2-6 vs. Andy Murray. yeah, you’re right, dunno where i got that…thanks. Great preview. I hope Roddick is able to pull it off as well, even if he may just wind up losing to Federer in the final. With how hard Roddick has worked it’s really showing this year, and it would be just that sweet if he could get the Wimbledon title. He deserves it. Either way, I expect the Roddick/Murray match to be the best one at Wimbledon this year. ur right about the review on fed… it is expected.